Finally, the budget session 2018 has begun in the Parliament today. President Ram Nath Kovind is addressing the joint sitting of both the houses of Parliament. 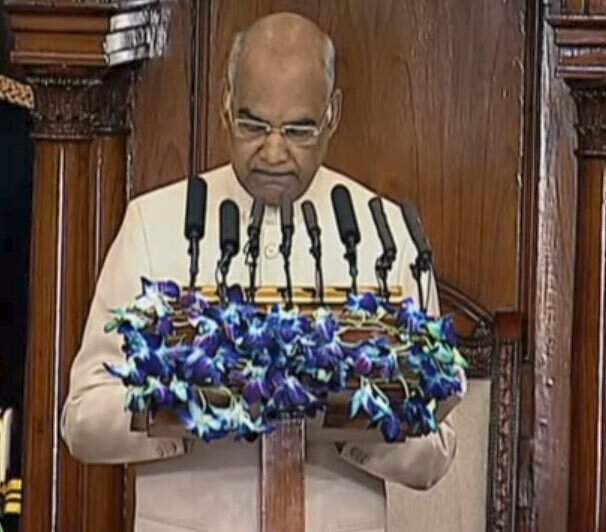 The President Ram Nath Kovind in today’s budget session address said that I hope soon the Triple Talaq bill will be passed by the government so that Muslim women can live their life without fear and dignity. However, the Triple Talaq Bill has already passed by the Lok Sabha and yet to get the green signal from Rajya Sabha. Ram Nath Kovind started his speech with the thought of Baba Saheb Ambedkar who says that without economic and social democracy the political democracy is unstable. He said we will soon realise the dream of New India vision in 2018. In his speech, President also said that Unesco recognise Kumbh Mela as the intangible cultural heritage of humanity is the matter of pride for us. And he also spoke about some biggest achievements of government such as Mudra Yojana and Jan Dhan Yojana which had benefitted the people of India. With this, he revealed that the government is now committed to double the income of the farmers by 2022. This budget session will mainly focus on the economic sector, poor section and the women rights of the country. After President’s address to the joint sitting of Parliament House, the Economic survey of India will be taled before the Parliament. As per the reports, the finance minister Arun Jaitley will present the Union Budget 2018-19 on 1st February 2018. Along with the farmer’s double income and Poor’s development, the government will also soon amend Muslim Women bill which is related to Triple Talaq, Right of Children to free and compulsory education and the Code of wages bill. In a speech, the president has also mentioned about the work which has started to broaden connectivity in villages.